A comp with little glue, a lack of cohesion and consistency is more than compensated for by bringing together a group of "heavy hitters" among Nat's early recordings as a popular vocalist. A Portrait Of Jennie is a dreamy ballad dedicated to a lady whose only portrait exists in his own heart. Aww. Yes, it's a suitably lovely song and arrangement, sung with a dreamy smile on Nat's voice. What's not to like? However, I must confess I don't think I've ever heard the song without drifting off a bit. Which is okay I suppose as it is meant to be a dreamy affair. Tee hee. It may not be a song that grips ya through and through but it paints a pretty picture. So to speak. Easily among the best ballads Nat sang in the Trio era is his version of Irving Berlin's What'll I Do? A strong ballad it is and this is hands-down my favorite recording of it. The reason is simple: there's a sober honesty to the reading that internalizes the song, nailing the lyrics as well as the overall frame of mind. Gets me. Also for all the gazillion love songs and lost love songs, there aren't many songs, that come to mind at any rate, which have this perspective. Candidly asking, internally: What'll I do? There's no better singer for such a thing than Nat. All the more impressive that he also accompanies himself on piano to superb effect. Oscar Moore (guitar) and Johnny Miller (bass) are just as eloquent and plainly stated. A Trio high point in my opinion. Similarly bare is his vocal for Lost April. 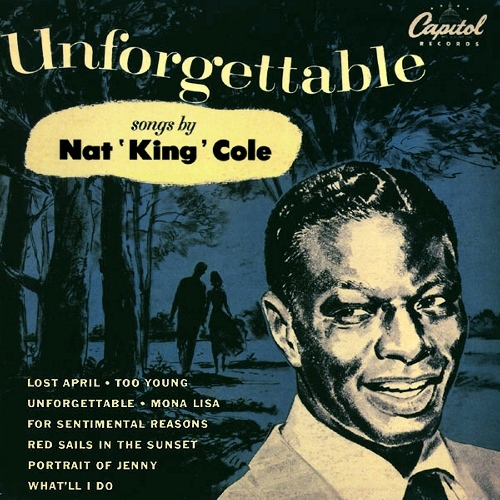 Nat would revisit this song in his album with George Shearing to similar effect. Among his first efforts as featured vocalist outside of the Trio context on record, Lost April is a delicate, haunting reflection on bygone love and times which, as with a few of his other efforts such as Nature Boy, reaches for an existential note as well. Hits 'em, too. Vocally he's reaching a bit for some of the long lower notes his raspier later voice would be so adept at, but in other areas his vocals are already quite refined here. The interplay of Nat and the arrangement through many verses is sensitive and a fine example of the art. Answer Me My Love has always sounded to me as if it needs to say Answer Me, My Lord, as it seems it was initially written. That said (...), this big arrangement with choir contrasted against Nat's fairly quiet and gentle vocal couldn't be more apt. One might also see it as another instance of a Nat ballad reaching for more than a straight-ahead love song while still satisfying on that level. Well received at the time, so I'd have to say it worked. However I'm not so inclined to like Hajji Baba. It's fun to sing in some ways, little doubt, and has a certain novelty. Does it need more? Goodness knows, many songs to this day aspire to nothing more than that, and that's fine. But what would you do for a klondike bar? Sing this song with a turban on your head? Pronounced tyoi-bin of course. Was it inspired by a story of someone's wife-count? Dated in a bad way I'm afraid. Reminds me of Hollywood Oriental kitsch a bit much. Functions as a light respite in this album though, and at least in phrases involving its perpetually besotted namesake with the oversized tent, it may be fun to sing. Back to classics. A huge hit among Nat's early championship winning marathons as a pop vocalist, Too Young is even a bit iconic for its time. A grand introduction for a grand piano (Buddy Cole's I presume) overdoes it, perhaps as outsized in relation to the rest of the song as the feelings the subjects of the song share may be for their age as viewed by their elders. Highly melodic, sweet piano and strings, affable vocal from Nat, it's not hard to imagine many folks found it a nice listen. Why, you'd hardly believe it's a rebellious rebuke, would you? Mona Lisa is striking when one takes a good look at her. Talking about this song of course. It's been duly noted that this was the "breakthrough" job for Nelson Riddle. Although Les Baxter was contracted and credited for arrangements, it's said he had farmed this one out to Nelson Riddle, who was then little known. Nat learned the truth and we witness the start of a beautiful friendship between Nat and Nelson herewith. Little wonder. It's all melody and implied time; there is zero rhythm section through the whole deal, scored for Nat, strings (a bit after the fashion of a string quartet), acoustic guitar and nothing else. Nat's neigh infallible time is put to great use and it doesn't phase him at all. With his vocal standing clear like a column among musical surroundings that evoke classical Venetian surprisingly well, should we be so indulgently descriptive (oh my, we were) Nat muses at or about a lady's nature not entirely unlike a viewer observing a painting whose reputation had preceded it. Not many folks attempted to cover this song despite its huge success. It is hard to imagine it turning out as persuasively, or good at all when it comes to that, if done any other way than Nat and Nelson did (although it was right up June Christy's alley in every way except for the detail that it is from a male perspective). It's also said Nat didn't care much for this song at first but "came to appreciate it more" as time went on; his re-recording does seem to me to be consistent with that. Reaching back to the Trio's heyday, this comp next plucks out one of the most popular ballads in the Trio's book, the guileless (I Love You) For Sentimental Reasons. An uncanny knack for singing lyric with sincerity is among Nat's many gifts. This song is as good an example as any in that regard. Records like this also leave me a bit perplexed as to why folks would be surprised when he went solo and took a place among the top popular vocalists; just who did anyone think would have been any better? Being popular, sentimental and extensively covered by all kinds of bands and soloists for many years, Red Sails In The Sunset seems to have been regarded with some derision among those annoyed by the often highly sentimental if not mawkish renditions often given it. I've seen it referred to as Red Snails In My Swimsuit or something to that effect. This is mentioned here since you'd never know it from this recording. It's highly sentimental to be sure, but Nat and company here make straight for the heart of it. Even with orchestra and chorus, imagine that. Pete Rugolo's painterly skills with orchestration give every bit of the obligatory pretty picture for a backdrop, but more artfully than one might expect. Likewise Nat, his voice seeming to take on complimentary hues, manages to avoid the stiffness of many prior vocalists with a more intimate approach to both words and music. Yet another example of a career that often kept a lot of folks employed turning out a product of kindly inclined popular art, there isn't a whole lot to say about Pretend other than to compliment how beautifully the sentiments are expressed. The sorrowful present can be felt motivating the plea to find solace in the gift of fantasy - or it's simply an escapist bit of sugar-coating sentiments depending upon how one looks at it. Personally I appreciate the message and well meaning behind it and enjoy listening to it, though like Red Sails In The Sunset I hear it's been able to drive some folks up a wall. A more appropriately amiable singer one won't find, and Nelson Riddle's arrangement is a chunk of sonic cloud nine, particularly in its elegantly simple instrumental break. Reaching for an epic scope in stating a private hope, Make Her Mine may not be among his greatest, but it has its moments and Nat is an ideal, perhaps the ideal singer for it. His was not a voice in the wilderness, to paraphrase the lyric, yet Nat's knack for feeling like one's internal voice makes lines such as that or the plea "oh heaven above me" work in a surprisingly disarming way. Anything but simple, Nelson's arrangement again attempts to take a literal approach to some of the lyrics (a shimmering effect in the strings for "make the river deep" that elevates for "the mountain tall" to sweep silkily down like a breezy sky behind "the cornflower blue as the summer sky" being a keen example) and attempts making quite the epic drama at times (the dramatic rolls leading to the final phrase perhaps a bit too overtly climactic for Nat, at least at this point). It is admittedly hokey, but I appreciate that a number of Nat's songs in this era seem to have been trying to tie the conventional love song sentiments with a wider range of themes, and moreover I'm just a sucker for this song. With divergent songs and arrangements, this album serves more as a handy compilation than an album. Also inconsistent is the sound quality, spanning as it does the late disc era (Lost April and (I Love You) For Sentimental Reasons are from 33 1/3 transcription discs) and early tape era (A Portrait of Jennie is the very first song of his recorded on tape). 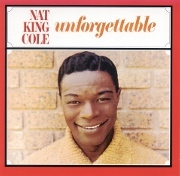 The collection proved very popular and a reissue of it, featuring a different cover (an early '50's picture of a smiling Nat standing before a brick wall), seems to have been among the first re-releases Capitol made of his music following his untimely passing in 1965. This site is not affiliated with Capitol / EMI nor the Nat King Cole Estate. This site attempts to conform to valid HTML 4.01 and valid CSS 2 standards for optimal accessibility.